Welcome to Dragon Ball Universe! 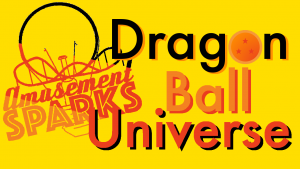 An amusement park that allows you and your friends to take part in becoming earth’s newest and most powerful heroes – set in the world of Dragon Ball. You can fight against unique and powerful enemies on our interactive battle coasters. Build your power by using hand-mounted energy beams to progress through terrain and defeat enemies. Experience augmented reality with our AR Scouter technology… The opportunities are endless. Work together with your friends to increase your power level and achieve Super Saiyan status…. Explore space (and time!) on your quest to find the 7 mystical dragon balls through Dragon Ball Universe.